For those who missed our Summer Festival we haven’t forgotten you! Over the next few weeks we will be adding a few of the recipes from the pop-up Botanical Beauty Bar so you can make the most of the long days and warm temperatures for the last few weeks of Summer. This event was hosted my Michael Isted from The Herball and below Michael shares his recipe for the our exclusive Content Herball Beauty Juice and teaches us how to make Lime Cordial at home. 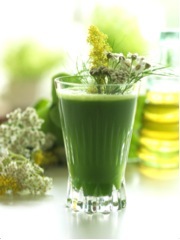 The Content Herball Beauty Juice is a fresh green juice formulated to stimulate and cleanse the body inside and out. Nutrient dense and packed full of phyto-chemicals to help detoxify and promote healthy looking skin. Harvesting herbs: Nettle is best picked end of April/May before it flowers but it does grow later in the year just be sure to pick the tips of a young plant, that is light green in colour and the stem is not too woody. Pick away from busy roads and be sure the area has not been sprayed with chemicals. Cleavers and plantain is best picked in May & June just as it comes into flower. Method: Using a masticating juicer, I use a Oscar VitalMax 900, place rinsed herbs through the juicer followed by 50ml of spring water. Slice the apple and place through juicer. In bottom of glass add lime cordial and fresh lemon, ice (optional), pour over herb and apple juice and stir. Garnish with freshly picked seasonal herbs for example fennel tops, yarrow and agrimony. Method: Keep zest of 1 lime but juice them all. In a pan add a handful of crushed fennel seeds, honey, lime juice, grated zest & water and gently heat, bring to simmer, whilst stirring for 5-6mins, allow to cool, fine strain through muslin and bottle. This lime cordial is also fantastic enjoyed with still or sparkling water. More on the benefits of herbs from Michael can be seen in Psychologies Magazine September Issue.